Little Sisters of the Poor case: Supreme Court grants a temporary reprieve. Did Little Sisters of the Poor Win or Lose at the Supreme Court? The Supreme Court extended a stay on the contraception-mandate form originally granted by Justice Sonia Sotomayor. The Supreme Court said late Friday that the Little Sisters of the Poor don’t have to fill out the Obamacare form for nonprofit religious groups seeking an accommodation to the contraception mandate. Instead, in order to get the exception, Little Sisters, which provides housing to elderly people in need, essentially has to provide the same information to the Department of Health of Human Services in a … form (or maybe it’s a letter?) the court devised itself. Got that? I know, it sounds weird, but that’s pretty much the upshot of the court’s three-sentence order, which will remain in effect until the 10th Circuit Court of Appeals rules in the case. And which “should not be construed as an expression of the Court’s views on the merits,” the order states. If this is an odd compromise, well, it’s also a tricky case. Liberal commentators have said otherwise: There’s no serious problem of religious freedom here, the New York Times editorial page and Slate’s Amanda Marcotte argue, because all Obamacare asks religious organizations to do is sign a form certifying that they don’t provide contraception—as they’ve already made clear. These cases are about a single two-page form. But there is no clear answer to what signing that form means—or even, rather bizarrely, what concrete effect doing so has. There are about 20 lawsuits bubbling up over this around the country, with religious groups saying the form is the gateway to authorizing contraception coverage, one they don’t want to walk through. The government responds that actually, for some of the groups, signing the form will mean nothing at all. Not signing, though, subjects them all to hefty fines. The lower courts are split over these cases, and so far most of them have actually sided with the religious groups rather than the government. 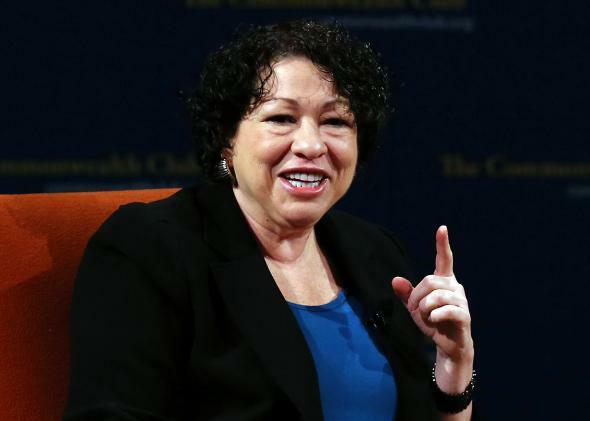 And so, understandably, first Justice Sonia Sotomayor on her own and now the full court have hit the pause button at this preliminary stage, when what’s at issue isn’t who wins but whether to delay the fines while the courts wrestle with the underlying questions. These cases involve the kind of tangled facts that take time to sort out. In the meantime, it doesn’t make sense to impose big fines on groups like Little Sisters. The Affordable Care Act requires health insurers to cover comprehensive health care for women, including a full menu of contraception and sterilization services. The Department of Health and Human Services decided what to cover based on recommendations by the Institute of Medicine. The IOM brought together a bunch of experts, who reached the obvious conclusion: Yes, contraception is crucial to basic health care for women. After all, nearly half of pregnancies are unintended, and those pregnancies can have adverse health consequences. All good so far. The problem is that most of us get health insurance through our employers, and some of them object to birth control on religious grounds. The Religious Freedom Restoration Act, passed by Congress to safeguard the free exercise of religion in 1993, clearly applies to nonprofit religious organizations. (Whether it also applies to for-profit secular companies is a separate question that the Supreme Court will address later this term, in the Hobby Lobby case and another one involving a Mennonite cabinetmaker.) When the United States Conference of Catholic Bishops, among others, kicked up a fuss about the contraception mandate back in 2011, the Obama administration created two different exemptions. The first is for houses of worship (churches, mosques, and synagogues). It’s a total exemption—these employers don’t have to do anything to get it and their employees have to pay for their own contraception. The second kind is for religious nonprofit organizations, and this one is more like a partial accommodation. These groups, which include Little Sisters of the Poor, the University of Notre Dame, and hundreds of others, have to sign the two-page form and send it to the “third-party administrator” of their health insurance plans. Those entities (TPAs for short) then are bound to provide contraception to the religious group’s employees, according to the Obamacare regulations, without billing or in any way involving the employer. The government is supposed to pay instead, by lowering the fees the TPA pays in the federal health exchange. Notre Dame wants to eat its cake, and have it still, at the expense of Congress, administrative agencies, and the employees who will be affected. Notre Dame is free to opt out of providing the coverage itself, but it can’t stop anyone else from providing it. But that is essentially what Notre Dame is requesting. The non-exempt plaintiffs are required to complete and submit the self-certification, which authorizes a third-party to provide the contraceptive coverage to which they object. They consider this to be an endorsement of such coverage; to them, the self-certification “compel[s] affirmation of a repugnant belief. Honestly, isn’t this like a picture you can look at and see two entirely different things? One view is that asking Little Sisters of the Poor to sign this form is like asking a Quaker to state his or her opposition to fighting a war in order to be considered a conscientious objector. You can’t argue that saying you refuse to fight itself burdens your freedom of religious expression because it means someone else will go to war. But maybe that’s the wrong way to look at it. The alternate view is that demanding Little Sisters of the Poor sign this form to avoid a big fine compels the group to ask someone else to sin on its behalf. If you see this as the group opening the door to getting their employees birth control, which they have a genuine religious objection to doing, then maybe it’s not fair to ask them to do that. I don’t know about you, but I can see it both ways. Important note: Even if you choose the second view and think this Obamacare regulation does burden the exercise of religious freedom, you haven’t decided the case yet. The Religious Freedom Restoration Act says you must then decide whether there is a compelling reason for the government to impose the burden in the first place. On this one, to me the answer is a clear yes, because of the tangible and significant health benefits for women that come with covering contraception. Also, some of the religious groups that are suing don’t offer ERISA-based church plans, so they don’t fall into the gap between these two different sets of regulations. Notre Dame, for example, has decided to go ahead and sign the Obamacare form, knowing that its employees will actually get contraception coverage, while the lawsuit it has brought continues to play out. This case, and others by religious groups who are clearly subject to the contraception mandate, are the more interesting ones, which will eventually determine the outcome of this clash between religious freedom (arguably) and women’s health. Now that the Supreme Court has issued its Friday order, the action moves back to the lower courts. Godspeed to them.